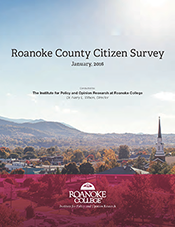 Roanoke County contracted with Roanoke College’s Institute for Policy and Opinion Research to perform a random citizen's telephone survey in the fall of 2015. More than 600 survey participants were polled for this statistically valid survey. The survey questions included what Roanoke County citizens think are the most important strategic issues facing the County over the next five years, along with rating the importance and quality of public services the County currently offers. The Board of Supervisors reviewed the survey results at its January 30, 2016 retreat and used this information to decide on specific areas of focus for Roanoke County's Community Strategic Plan. For more information about these areas of focus, please see our FOCUS GROUPS page. 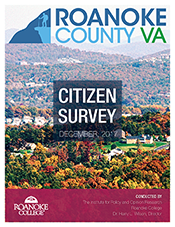 In December 2017, Roanoke College conducted a follow-up survey to measure citizen satisfaction with the services and programs offered by Roanoke County. For more information about the community strategic planning process please contact Dan O'Donnell, Assistant County Administrator at (540) 772-2017.